This morning, I saw a Facebook post for a cemetery legend out of Marion, Kentucky. The legend was that of the Pilot's Knob Cemetery Witch Girl. Since I'm always short on interesting places in the Bluegrass State, I decided to research this location a little more and add it to the Haunted Kentucky Page. What I found was not exactly shocking. From what I can find, there is not one single supporting piece of evidence to show that there's even a grain of truth buried somewhere in the deep recesses of this urban legend. 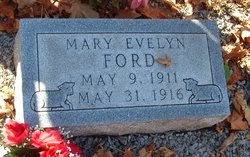 As the stories go, Mary Evelyn Ford lived with her mother near Marion, Kentucky around the early 1900s. For reasons unnamed, the mother and the girl were universally believed to be witches by the townspeople, and thus, in an act of vigilante justice, the townspeople swooped in and burned both mother and daughter alive. The mother's charred remains were taken away, yet the little girl's body was buried in the Pilot Knob Cemetery. However, it was believed that without proper precautions, her spirit would seek vengeance on those who took the lives of her mother and herself...so she buried in a lead-lined coffin, and covered in concrete and gravel. As an added precaution, her grave was surrounded by an iron fence, made of interlocking crosses, designed to keep her spirit from escaping. That hasn't stopped her from trying, however. Visitors to the site have noted that they've seen the apparition of the little blonde girl, wandering back and forth in her white iron cage, wearing a singed white nightgown. She reaches out to those who get close enough, trying to pull them in with her. She's even been seen making faces at people, peering through the iron bars. 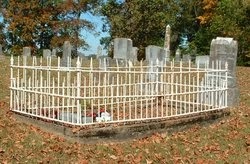 If you do manage to climb over the fence, its said she'll hold you down and pull you into her grave with her. In reality, Mary Evelyn Ford was the youngest of at least six children born to James Andy Ford and Mary Rebecca Davis Ford. According to her death certificate, she passed away on May 31, 1915, just a few weeks after her fifth birthday, from peritonitis. Her mother, who legend claims is missing, is really buried in the same cemetery, dying in 1955 after outliving her husband and at least two of her children. It seems like the legend was nothing more than a made up story intended to keep people away from the cemetery at night...and to account for why Mary's grave seems to be the only one with a gravel top and iron fence. But...that still doesn't account for some of the other spooky goings-on in the cemetery, one of which is directly related to the little witch girl. There is said to be an evil presence in the cemetery, that of a man known only as The Watcher. The Watcher allegedly was killed at a nearby bridge, but is drawn to the cemetery by the little witch, whom he tries to capture, but cannot, due to the fence of crosses. I had wondered why somebody would invent a story, like that, about a child. It does make sense that it was invented, to keep people out at night. Nothing about the story adds up the little girl was not in a lead coffin but put in a steel coffin concrete poured onto the coffin and covered in gravel but I have a inside look and actually talked to the little girl I am a medium and have alot of unique abilitys the girl did have a a stomach disease that could not be cured but the puritans the same bloodline from the Salem witch trial era was involved this happened in 1916 they covered up their crime so it would not start a panic or a riot for their actions they used the stomach disease as a way out of the crime that they did because there would be less of a question to their beliefs what is messed up they had a trial day but the villagers didn't want to wait until the hearing took matters in their own hands and went in the mother's house took her and the little girl out in the middle of the night and burned them alive so they could cover up their tracks of the wrong they did the mother was separated from the little girl she just wants her mom that is why she paces the grave site looking for her mom's return to no avail the mother is lost has not even moved on because they want to be reunited now once reunited they may take vengences on the relatives of thoes that ended their lives who are we to stop them from doing just that they were robbed of life these spirits are very angry and have turned malevolent the mother is actually baried in a unique marked site the after and the mother have a plaque a final resting place but the mother is not there it was part of the cover up to hide the crimes.this watcher is not a watcher at all. A watcher is the ones called the sons of God this also relates to the nephlilms the giants the demi God's and the four books of Enoch that thing is not a watcher it is a very powerful demon that wants the little girls soul but can't cross the interlocking crosses this demon is acient I am doing a full investigation on this and am going to reunite the little girl and her mother that is what they want but agian that thing is no watcher if you want research the books of Enoch there are 4 volumes to the complete book. Sooo Tim Obryant what was the outcome? so sad, this propanda about Mary. may her soul rest in peace!